Brothers from Burlington 4 have been working to promote the AOH. The Monitor recently recognized their efforts and wrote a good article about our brothers from Burlington County. The way Bill Brennan sees it, there are two major bonuses about the Ancient Order of Hibernians, which is the oldest and largest Irish Catholic fraternal organization in America. The A.O.H. provides an opportunity for men to come together and celebrate their Catholic faith and their Irish heritage. And it also allows members to participate in community service activities that benefit others. It was based on Brennan’s own long-time experience being a member of a Hibernian division in Philadelphia that eventually led him to co-found one of the newest divisions in the Diocese of Trenton – the Mike Doyle Division 4 in Burlington County in 2011. According to Dr. Dan Fuzer, who serves on the division’s membership committee, and is a member of St. John Neumann Parish, Mount Laurel, the Mike Doyle Division 4 was formed as a result of many of the members being “Philadelphia transplants.” There were members, like Brennan, who had previously lived in the north and northeast sections of the city and were active in A.O.H. divisions there. Upon their relocating to New Jersey, a good number settled in the Burlington County river towns of Palmyra, Riverton, Cinnaminson, Delran and Riverside, but even after moving to New Jersey, they continued their A.O.H. membership in Philadelphia. The Mike Doyle Division 4 was named in honor of the late Mike Doyle, for his unfaltering support for a united Ireland. Doyle, who was also a dedicated family man and a successful business manager in Philadelphia, passed away in 2008. Fuzer is pleased that membership has increased in the past 18 months, going from 68 members at the time of the division’s founding to the current 130 members. In addition to the Burlington County river towns, the division has also drawn members from Camden County and other Burlington County towns such as Mount Laurel. Of course, it’s the division’s goal to generate even more members, Fuzer said, then added that in order to be considered for membership, a male must be at least 16 years old, of Irish heritage by birth or descent and a practicing Catholic. “New brothers are very welcome in our division,” he said. Meetings are held on the third Thursday of each month at 8 p.m. in Throw Backs on Route 130, Delran. Division 4 members participate in a range of activities including marching in the the Mount Holly and Philadelphia St. Patrick’s Day Parades and the Riverton Fourth of July Parade, and hosting fundraisers to benefit organizations such as Catholic Charities’ Emergency Services in Delanco and for Hurricane Sandy Relief Efforts on Long Beach Island. Fuzer reflected on the A.O.H. motto: “Friendship, Unity and Christian Charity,” then spoke of how proud he is to be part of an organization whose origins date to the early 16th century in Ireland, and that the first American A.O.H., was established in New York City in 1836. “It has been through the Hibernians that I’ve found a group of like-minded Irish Catholic men of whom I am proud to call brother,” he said. 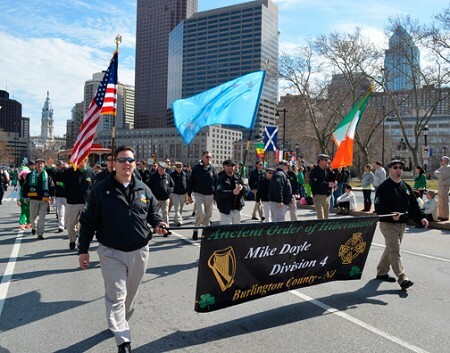 More information on the Ancient Order of Hibernians Mike Doyle Division 4 or other divisions within the Diocese of Trenton may be found at http://aohmikedoylediv4.com. Mary Stadnyk is news editor of The Monitor, newspaper of the Diocese of Trenton. This article first appeared in the March 14, 2013 issue of The Monitor and is reprinted here with permission. Newspaper website http://www.trentonmonitor.com.